Another great album from Mumy! As Usual, Another great album by Mr Mumy. This is not an album to just buy and listen to once - as you'll be addicted to listening to it time and again. 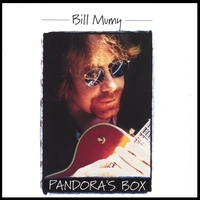 The talent of Mr. Mumy is once again demonstrated by his creative skills on this album! Each track is performed and produced by Mr. Mumy and each is a treat in itself. This album is a must buy for anyone that has a clue of what Bill's music is like - or for those who want to hear music like it was meant to be! Highly recommended! Buy it. You won't regret it. Bill Mumy holds all keys to everything! With a title like Pandora's Box, it is no wonder his song Buried Treasure is the sexiest song around. It smokes!!! Wish I could describe exactly what I see when he is singing those lyrics......but this is a family show, right? I also loved the pipes in Simple Man and Hard Road Home just hits home! She'll Never Know is a cry about a past crazy trip and Done Me Little Good is a road not taken. But the sweetest song of all is It's Not Your Fault. Mumy always picks the best CD song endings! Bill Mumy grabs you at the very beginning and holds you until the very end. With a sigh, a smile, and a few tears with every listen - this is a forever favorite. Let the music in this PANDORA'S BOX escape and surround you.